This is your opportunity to scoop up some inexpensive blasting ammo for your .357 Magnum chambered revolvers and lever guns! 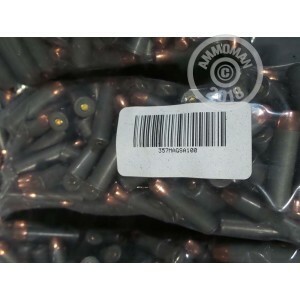 With no discrimination for headstamp, bullet type, or manufacturer origin, this grab bag has been assembled from loose rounds which could not be previously sold due to blemished original packaging. Our staff, keen to maintain quality for the shooters' benefit, has inspected and verified each .357 round for functional condition and correct caliber before re-packaging. In short, we clean up the mess and you reap the cost savings! The only catch is that we cannot guarantee the component make-up of these rounds; cartridges will feature a mix between non-reloadable steel and aluminum casings loaded with projectiles of varying type and weight, with the majority being FMJ. That makes this 100 round package appropriate for practice, plinking, and any shooting activities where you want to have fun without emptying your wallet. I ordered 3 bags and its all Tull ammo. Tul .357 is quite irritating because the casing swells up and they become difficult to get out. i thought i was getting a mixture of brands..
Had to use tool to tap those cases out.